Saturday was a beautiful day in Marinwood with the Waterdevils hosting the Terra Linda Orcas. 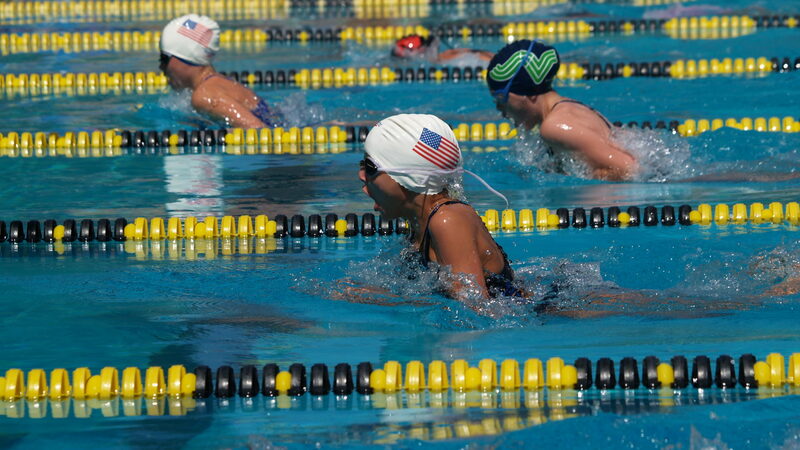 Many swimmers from both teams posted best times and blazing fast swims. In the process, 11 records fell at the Marinwood pool! Swimmers from both teams enjoyed mingling and cheering with their neighbors and classmates and good sportsmanship was on full display. It was the biggest dual meet of the MSL season, with close to 500 swimmers from the two largest teams in the league competing for All Star times, best times, and plain old good times! While great swims were recorded by both teams, the true victory belongs to the volunteer snack bar crew that fed the crowd of over a thousand without running out of food! Congratulations to long time Wave swimmer Ryan Schoenlein for breaking the Redwood High School pool record in the 15-18 Boys 100 Free with a new time of 49.34. A graduation present from Ryan to his team! Congratulations also, to all of the newly qualified All Star swimmers from both teams!